A huge disappointment: the Ativ Smart PC is woefully underpowered and cripplingly, hilariously overpriced. An iPad, Nexus 10 or Ultrabook would do a much better job, and you'd pay a lot less money for the privilege. Samsung's device just isn't good enough. So, Microsoft and Intel really want to get into tablets. We know this not just because they've told us, but because they're really throwing everything at it. First Microsoft offered Surface RT, which matched the iPad in having an ARM processor and a scaled-back operating system. Then Microsoft and Intel joined forces to make the powerful Surface Pro, a tablet-shaped Ultrabook. Now there's an attempt to get something in between these two: enter the Samsung Ativ Smart PC XE500T1C, an 11.6-inch multi-touch tablet. It runs full-blown Windows 8 (not RT), so supports legacy apps, desktop apps and anything else you'd care to fill it with. It boasts Intel's new Atom Z2760 processor (also known as Clover Trail), which is designed to offer the superb power efficiency of ARM processors, but still be a traditional Intel x86 chip. So, you've got a Windows 8 tablet that promises all-day battery life. Is it too good to be true? For a start, the tablet part of the equation is actually optional - the Ativ Smart PC comes with a clamshell keyboard, meaning you can turn it into a kind of Ultrabook. This kind of add-on seems to be a theme for these Intel Atom tablets: the Acer Iconia W510 uses the same processor and offers full Windows 8, while also offering a keyboard dock. The difference is that the Iconia's dock contains an additional battery, but the Samsung Ativ Smart PC's doesn't. It has to be said that this isn't the most portable tablet on the market - its relatively large screen means that it's not small at 296 x 184 x 9.9mm (11.6 x 7.2 x 0.38 inches), with its thickness rising to 20.5mm (0.8 inches)with the clamshell. And at 744g (1.65lbs), it's heavier than an iPad 4 or Google Nexus 10, though lighter than the Surface Pro. In terms of looks, the Samsung Ativ Smart PC is reminiscent of Samsung's Chromebooks - all plastic and rounded edges. Well, not all plastic - the multi-touch screen is glass. But with its shell of blue plastic, with a brushed effect, it's more what you'd expect to see in a laptop than a tablet. It won't win any design awards, but the build quality seems sufficient. The clamshell is actually a slightly different colour, and the mismatch makes it look kind of low quality, but then it is a budget machine. The clamshell itself sounds hollow and rattly when you tap it (because it more or less is hollow, presumably), but the hinge is also built solidly. Two latches hold the tablet in place when it's in the clamshell, but it's easy to pull out. The Windows Start key just below the screen is hidden when it's in the clamshell, but then that's why you have one on the keyboard. You can still reach the other keys on the rim of the tablet, though - the on/off switch and the rotation lock key (which is less useful in the laptop mode, naturally). The clamshell offers you a full keyboard and a small trackpad, which supports multi-touch gestures. It's not the only add-on you get, though - there's also Samsung's S-Pen stylus, with a compatible digitiser built into the screen. 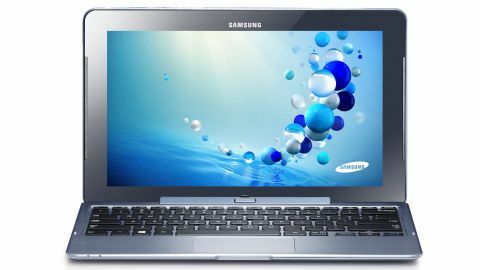 The Samsung Ativ Smart PC is priced at £699/US$749.99/AU$999, which includes the clamshell and S-Pen. It also has a big brother available, the Ativ Smart PC Pro, which includes an Intel Core i5 processor instead of the Atom, and is generally higher-specced across the board, much like the Surface Pro. That one goes for £999/US$1,199.99/AU$1,399.